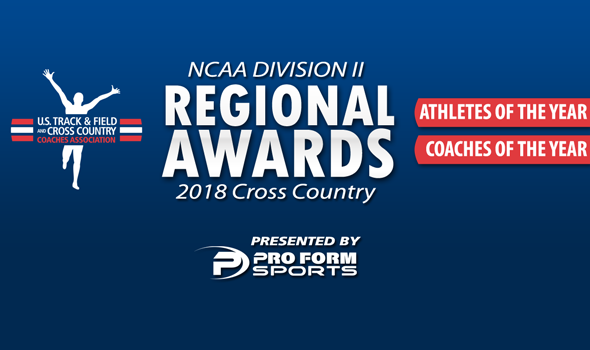 NEW ORLEANS – Regional Athletes and Coaches of the year for the 2018 NCAA Division II Cross Country season were announced by the U.S. Track & Field and Cross Country Coaches Association (USTFCCCA) on Tuesday following Regional Championship Weekend, as voted by member coaches from that division. Information on each of the award winners can be found below. These selected athletes and coaches will end their seasons with the running of the 2018 NCAA Division II Cross Country Championships in Pittsburgh, Pennsylvania on December 1. USTFCCCA Regional Awards are presented by Pro Form Sports. Weitzel, a senior from Athens, West Virginia, won the individual title at the Atlantic Regionals this past weekend as he posted a mark of 34:00.3. Weitzel is the first Concord athlete to win an individual regional championships in any sport at the university. He also punched his ticket to nationals with the performance. Weitzel also won the Mountain East Conference Championships and took first in his second race of the year at the Golden Bear Classic III. Kimutai won the individual Central Regional Championships with a 29:48.5 performance. The freshman from Eldoret, Kenya, was the third Lion to take home an individual title in the past four years at the meet. Kimutai paced his team to the team championship as well as the school earned an automatic bid to NCAAs. He also won the Mid-America Intercollegiate Athletics Association Champions earlier this season. Kimutai also picked up a win at the Fort Hays State Tiger Open and took 15th against a strong field at Arkansas’s Chile Pepper XC Festival. Kipkosgei, a senior from Kapsabet, Kenya, won the individual championships at the East Regionals with a time of 31:11.5. It is the standout’s third consecutive regional championship. Kipkosgei was also crowned the individual champion at the Northeast-10 Championships and has won all five races he has competed in this season. He paced his team to a second-place finish at regionals as the Yellowjackets will toe the line at nationals for the fifth straight year. Winders captured the Midwest Regional title in 31:05.1 over the weekend. The freshman from Mansfield, Tennessee, saved his first career victory for the perfect time as the win helped propel the Eagles to a fourth-place finish and an at-large bid to nationals. Winders also placed second at the Great Lakes Valley Conference Championships. Noble, a junior from Greenfield, Indiana, took home the South Regional individual championships with a 31:19.2. The title was the first individual championship in program history. Noble won the race by 25 seconds and helped pace his team to a second-place finish which earned them a spot at nationals. He also won the Gulf South Conference Championships and will enter NCAAs on a three-meet winning streak. Colligan walked away a winner at the South Central Regionals after a 30:31.9 performance bested the field. The redshirt senior from Holt, Michigan, made it a perfect 2-for-2 in races this season as he also won at Slippery Rock’s Pre-Nationals. Colligan led his team to the regional championships as well, which punched the program’s bid to nationals. Chepkesir, a freshman from Eldoret, Kenya, won the Southeast Regional with a 31:10.0 performance. The showing helped his team to an at-large NCAA bid, its first appearance at nationals since 1981. Chepkesir also won the Peach Belt Conference Championship along with being named the conference’s Freshman of the Year. It is his third victory overall this season. King was the winner of the West Regional in 30:49.0 this past weekend. The senior from Morgan Hill, California, became the fifth athlete in program history to claim a regional title. King helped led his team to its third straight regional championship as well and also won the California Collegiate Athletic Conference individual title earlier this season. Belko, a senior from Hainesport, New Jersey, won the Atlantic Region by nearly 40 seconds with a 23:24.4 showing. It was just the second individual regional title won in program history, along with being the school’s second consecutive individual crown. Belko also won the Pennsylvania State Athletic Conference Championships and has fourth victories overall this season. She also helped her team to a second place finish at regionals, which advanced them to nationals. Schuette won the individual Central Regional crown with a 20:52.5 performance. The Bismarck, North Dakota, native captured the program’s fourth consecutive individual title and paced the team to its third straight team championship. The senior also placed first at the Northern Sun Intercollegiate and has wins in four of her five races this season. Fitzgerald, a junior from Kamloops, British Columbia, won the East Regionals in 22:10.9. The performance granted her a six and a half second victory against the strong field. Fitzgerald also won the individual title at the Central Atlantic Collegiate Conference Championships and has wins in 4-of-5 races this season. She earned an automatic bids to NCAAs with her performance. Berger was named the winner of the Midwest Regionals after posting a 21:06.0. The graduate student from Wadsworth, Ohio, was the third athlete in program history to capture a regional crown. She led her team to its 18th consecutive conference championships and also was named the individual title winner at the Great Lakes Intercollegiate Athletic Conference Championships. Edens, a junior from Gainesville, Florida, won the South Regional individual title in 21:18.7. The performance set a new school record for a women’s 6K as Edens won the race by more than 16 seconds. She paced her team to a regional title at the meet and was also the Sunshine State Conference Championships individual winner as well. Konieczek picked up a win at the South Central Regionals with a 31:25.4 showing. The senior from Zbaszyn, Poland, led her team to a second place finish at the meet to advance the Mountaineers to NCAAs, falling by just a single point to nationally-ranked No. 1 Adams State. Konieczek also won the individual title at the Rocky Mountain Athletic Conference Championships. Hanle, a junior from Gerolstein, Germany, was the individual winner at the Southeast Regionals at 21:39.4. It is the third consecutive individual championship won by the program. She also took third at the Conference Carolinas Championship to go with a victory at Pre-Nationals. Hanle will be joined by one other teammate at nationals this season. Chelimo continued her perfect season with an individual victory at the West Regionals with a mark of 20:57.5. The junior from Iten, Kenya, became the sixth female athlete in program history to win an individual championship. She also won the Great Northwest Athletic Conference Championships and is 5-for-5 in races this season. She paced her team to a regional title as well. Bias, in his fifth year with the program, led his squad to a team championship at the Atlantic Regionals. It was the first regional title won in school history. The Golden Eagles had four athletes earn All-Region honors as they recorded 64 points. Charleston also won the Mountain East Conference Championships early this season. Burnham, in his 23rd year overall and third as director of cross country and track & field, led his team to a team championship in the Central Region with 55 points. It was the program’s first title since 2009 and was the lowest point total recorded for the squad at regionals in school history. Burnham also had the meet’s individual champion in Kimutai (mentioned above). Missouri Southern also won the Mid-America Intercollegiate Athletics Association Championships. Boen, in his 22nd year with the program, oversaw his team win the championships at the East Regionals with 52 points. It was the second straight title for the program and the fifth overall in school history. The squad finished runner up at the Northeast-10 Conference Championships. Cowan, in his ninth year with the program, saw his team finish runner up at the Midwest Regionals. It was the best finish for the Cardinals since 2009 and a four-spot improvement over last season’s sixth-place finish. The group advanced to NCAAs with the performance. Rosolino, in his 16th year with the program, watched his team win the South Regional title to advance to nationals for the first time in school history. It was also the Eagle’s first regional championship. The group placed five runners in the top-16 to run away with the regional meet. Embry-Riddle also won the Sunshine State Conference Championships. Siemers, in his seventh season with the school, oversaw his team’s South Central Regional Championship in which the Orediggers knocked off nationally-ranked No. 1 Adams State. Six athletes earned All-Region honors at the meet which included individual champion Colligan (mentioned above). Ward, in his 15th year with the program, led his team to a third-place finish at the Southeast Regionals. It is just the third time that the program has advanced to NCAAs, which it has now accomplished in two straight seasons. He had four All-Region athletes at the meet as the Jags tied their program best for a regional performance. Towne, in his 22nd year with the program, coached his squad to its third straight West Regional Championship. He had all seven athletes finish in the top-18 at the meet which included individual champion King (mentioned above). The group totaled 39 points in the victory and also won the California Collegiate Athletic Association Championships. Foster, in his first year with the program, coached his team to the Atlantic Regional Championships this past weekend. The Fighting Scots repeated as regional champions with 64 points and had five athletes earn All-Region honors. Edinboro also finished as the runner up at the Pennsylvania State Athletic Conference Championships. Newell, in his 13th year with the program, oversaw his team winning the Central Regionals with a 29-point performance. It was the third straight regional title for the group who also had the individual champion in Schuette (mentioned above). The Marauders placed five athletes in the top-14 at the meet and also captured the Northern Sun Intercollegiate Conference Champions earlier this season. Boen, in his 22nd year with the program, coached his team to its eighth East Regional Championship in the past 10 years with a 58-point performance. It was the 15th title won overall as the team will now advance to NCAAs for the 18th consecutive season. The team also won the Northeast-10 Conference Championships this year. Issacson, in his second year with the program, oversaw his team’s third-place finish at the Midwest Regionals with 116 points. The Huskies are heading to NCAAs for the first time in school history after recording the best regional finish of all-time for the program. Michigan Tech had three athletes earn All-Region honors. The group also finished second overall at the Great Lakes Intercollegiate Athletic Conference Championships. Rosolino, in his 16th year with the program, coached his unit to a team championship at the South Regionals. The Eagles had the individual champion in Edens (mentioned above) and scored 78 points overall. The program also finished as the runner up at the Sunshine Conference Championships. Martin, in his 26th season with the program, added another trophy to his awards closet as Adams State captured the South Central Regional Championships with a 30-point performance. The Grizzlies placed all seven athletes on the All-Region team and also collected the championship at the Rocky Mountain Athletic Conference Championships earlier this season. Beil, in his eighth year with the program, led his team to a runner up finish at the Southeast Regionals. It marks the first NCAA Championships appearance for the squad since the 2013 season and is a large improvement from the group’s seventh-place regional finish a year ago. Flagler had three runners in the top-25 to tie its best finish in regional history. It is just the second ever bid to NCAAs. The team also won the Beach Belt Conference Championships. Friess, in his 28th year with the program, oversaw his team pick up the victory at the West Regionals. The group scored 66 points for their fifth regional title in school history and had four All-Region honorees, including individual champion Chelimo (mentioned above). The team also won the Great Northwest Athletic Conference Championships this year.